We offer a variety of worship services and we are always pleased to welcome visitors and new-comers. To find out more about our historic church please follow this link or to find us click hear. The parish and village of Ashmore sit on top of the downs at the western end of Cranborne Chase, part of the Cranborne Chase and West Wiltshire Area of Outstanding Natural Beauty. The village is centred on a large pond from which the village name derives. The village has a population of about 188 (2011 Census) including children. There is a modern village hall with playing field. The village is now served by superfast broadband via a local supplier, which means that working from addresses in the village becomes a more viable option than was the case previously. The village is in the catchment area for St Andrew’s Voluntary Aided Primary School in Fontmell Magna. 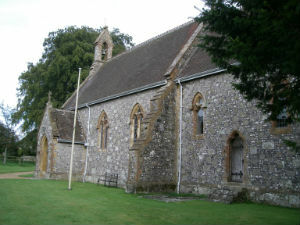 The first record of a church in Ashmore is from about 1200 but the present church was built in 1874 in the early decorated style and constructed of greensand stone and flint stone. The east window was installed in 1919 and the Reredos in 1949. In 1933 John Skeaping was commissioned to carve hunting scenes, based on Psalm 42, on the corbels of the Chancel. Carvings of four saints were added to those already in the Chancel. Simon Whistler designed and engraved in 1988 the memorial window to Denis Howard. The single bell is rung before each service. Services in St Nicholas’s are attended by those of many denominations. Ashmore is the only village in the Benefice to have regular Methodist services which are held in the village hall at 11.00am and the two congregations take it in turn to host Harvest Festival and Festival of Remembrance services. We welcome visitors to the church which is open from about 9.00am to 5.00pm every day.